« Three Collections for Christmas! CELEBRATE DEAR: DROP EVERYTHING AND READ DAY! 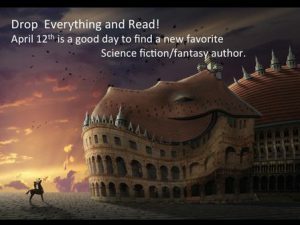 April 10 (12 AM)- April 13 (12 AM), 2017, my friends and I at the Fantasy Sci-Fi Network will be celebrating Drop Everything and Read Day. It’s a wonderful reminder to make reading a priority. That’s why we’re hosting an online author event, book sale, and contest with great prizes! I’ll be doing my author chat at 9:30 AM PST. Rafflecopter, for the contest is below, along with event links. DEAR programs are held on April 12th in honor of Beverly Cleary’s birthday, since she first wrote about D.E.A.R. in Ramona Quimby, Age 8 (pages 40-41). Inspired by letters from readers sharing their enthusiasm for the D.E.A.R. activities implemented in their schools, Mrs. Cleary decided to give the same experience to Ramona and her classmates. As D.E.A.R. has grown in popularity and scope, the program has expanded to span the entire month of April—offering classrooms and communities additional time to celebrate! Let’s not stop there. Drop Everything and Read throughout the year. Make reading a regular part of your routine—on your own, with classmates, parents, or friends. So pledge to drop what you’re doing and read a good book. Organizations, libraries, schools, or bookstores can participate by hosting a Drop Everything and Read event during the month of April. As an individual, you can participate by attending an event in your community or by reading at home with your children, siblings, or friends. Find lots of great DEAR resources on the D.E.A.R. website. FSFNet Event Info and Sale Here! 4/12 Chat with the Authors Here! D.E.A.R: DROP EVERYTHING AND READ! This entry was written by A. R. Silverberry, posted on April 11, 2017 at 5:36 pm, filed under Author Events and tagged .99 Book Sale, Book Sale, Contest, D.E.A.R, D.E.A.R Day, Drop Everything and Read, Drop Everything And Read Day, Ebook Sale, Fantasy and Science Fiction News Network, FSFNET. Bookmark the permalink. Follow any comments here with the RSS feed for this post. Post a comment or leave a trackback: Trackback URL.